CLUSTER FLY Service for Cluster Flies…We can help! Talk to the Local Experts! 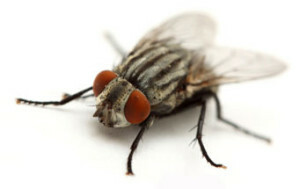 Homeowners are often bothered by the appearance of sluggish flies in their homes in late winter and early spring. Cluster flies are approximately 8 to 10 millimeters long. They are dark grey with black and silver (non-metallic) checkered abdomens, with many golden hairs on their thorax. These may or may not be present on older flies. Unlike house flies, their wings overlap when they are at rest. At first glance they resemble house flies; however, they are larger, darker and slower in their movements. These flies tend to be more abundant in houses surrounded by large lawns or those backing onto open parks. The name “cluster fly” is derived from their habit of gathering in clusters after entering a house in the fall and these may emit a sickly, sweetish odour if disturbed. Cluster flies hibernate in secluded areas of houses, such as in wall voids, attics, closets and empty rooms. They are a particular nuisance as they leave stains on the walls and curtains. Cluster flies are not usually a health hazard. However, cluster flies are a nuisance, and are parasites on our friendly earthworms. The eggs are deposited singly into cracks in the soil of lawns or open areas and hatch in approximately three to seven days. The larvae, or maggots, of clustering flies develop as parasites in the bodies of earthworms, after which they enter the soil where they pupate. The whole life cycle from egg to adult lasts between 25 and 39 days, depending on environmental conditions. There may be up to four generations per year. Adult cluster flies start looking for winter shelter when the days shorten in late summer and early fall. They are often attracted to the warm south and west sides of buildings, particularly those located in open and exposed areas. After sunning themselves during the day, the flies will look for a warmer place as the sun goes down and will eventually crawl into any small opening they can find in the house siding or under eaves. They may then settle within the walls or attic to hibernate. The problem becomes more evident on days when temperatures rise and the flies become more active, gathering in windows where light attracts them. Clustering flies can enter the home through the tiniest crevices around door and window frames, but also through any other small unsealed opening. To prevent infestation, ensure that all screens fit properly and that there are no cracks or holes which would allow them to enter into the house. Weather strip windows and doors, fill any cracks or crevices with caulking around doors, window frames and other openings in the building structure, and install insect screening over air vents in soffits. Clustering flies can be controlled by simply killing them with a fly swatter. Be aware that cluster flies will release an unpleasant odour and may stain surfaces when squashed. They can also be released outdoors or vacuumed up and the vacuum bag disposed of. Devices designed to trap the clustering flies are also offered on the market. These traps, placed in windows where flies are a problem, contain a powder that works like quicksand in trapping the insects that fall in.